The principality of Polotsk (or Polatsk) is also sometimes referred to as a duchy or even a kingdom. It was a vassal state which was created within Kievan Rus territories, and which was located to the south-east of Pskov (within modern Belarus). According to the Russian Primary Chronicle. a Varangian (almost certainly a Swede) called Ragnvald Olafsson established himself in Polotsk in the middle of the tenth century, making it one of the earliest Eastern Slav states. Unfortunately, he ran foul of the ruling Rurikid dynasty of Kiev when Vladimir the Great returned from exile in Scandinavia to try to claim the Kievan throne from his brother. Polotsk, though, had long been a Rus centre. Before the arrival of the Rus in the mid-ninth century Polotsk had been the tribal centre of the Slavic Krivichis. When the northern Slavic tribes had, according to tradition, invited Rurik and his brethren to command them in 862, he had made Novgorod his capital and had installed his own Rus governor at Polotsk. From the beginning of the Slavic expansion to the formation of the three Rus Slavic states, Novgorod, Ryazan, and Kiev, in the ninth century and even several centuries later, there were a considerable number of Balts in what is now Belarus and in the west of greater Russia. The process of Slavicisation which began in prehistoric times continued into the nineteenth century. Belarussians borrowed many words, most of them in daily usage, from the Lithuanian peasant vocabulary. The ethnography in the districts of Kaluga, Moscow, Smolensk, Vitebsk, Polotsk, and Minsk to the middle of the nineteenth century is highly indicative of the Baltic character. Indeed, Slavicised eastern Balts make up much of the population of modern Belarus and part of greater Russia. Varangian founder of the principality. Vladimir the Great returns from exile in Scandinavia to try and claim the Kievan throne from his brother. Seeking an alliance with Ragnvald through marriage to his daughter, Rogneda, her refusal triggers an attack on Polotsk which results in the death of Ragnvald and his son. Rogneda is taken by force to be Vladimir's wife. Son of Vladimir of Kiev and first of the Polotsk Rurikids. Iziaslav predeceases his father which, according to East Slavic house law, means that his descendants forfeit their right to inherit the throne of Kiev. Even so, Iziaslav's son still manages to inherit Polotsk, although he seems to be missing from some lists which show his brother ruling the principality from 1001. Son, but omitted from some lists in favour of Briacheslav. Briacheslav attacks and sacks Novgorod, but on his way back he is cornered at the River Sudoma by the army of his uncle, Yaroslav the Wise of Kiev. 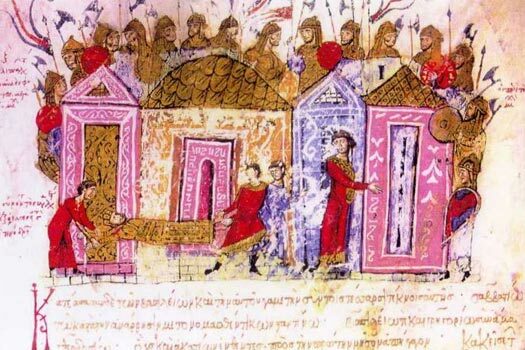 Defeated, Briacheslav flees, abandoning his booty from Novgorod, but Yaroslav pursues him and forces him to sign a treaty in 1021 granting him Usvyat and Vitebsk. Son. Prince of Kiev (1068-1069). Fled Kiev. Died 1101. Intent on staking a claim to the Kievan throne despite his ineligibility, Vseslav begins a campaign to secure Kievan territory. Unable to enter the capital, which is held by Yaroslav's three sons, he attacks Pskov and is repulsed. Between 1066-1067 he attacks and pillages Novgorod, burning the city. The Kievan prince who governs Novgorod, Mstislav, flees to his father in Kiev, and retribution is not long in coming. Kiev's princes join forces and march on Polotsk's south-eastern city of Minsk, sacking it and defeating Vseslav at the Battle of the River Nemiga on 3 March 1067. 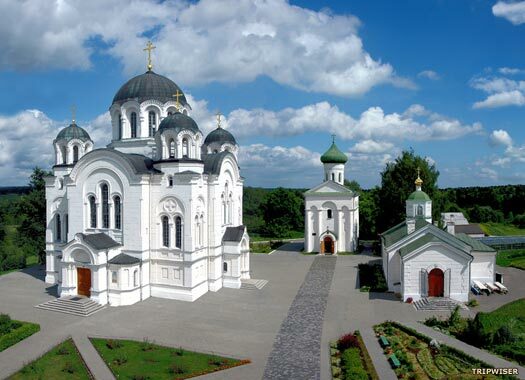 Whilst Vseslav is busy attempting to secure the Kievan grad principality, his Cathedral of Holy Wisdom is completed in Polotsk. It will serve as the location of his final resting place in 1101. A large number of nomads known as Polovcians attack the land of Rus and Izhaslav, Svyatoslav, and Vsevolod meet them close to the Al'ta (River Alta). They join battle in the dead of night but the Rus come off worst and are forced to flee. The Polovcians are given free reign to attack Rus lands and an uprising by the disgruntled Rus against their inactive prince forces him to flee to Poland. The same uprising frees Vseslav and he is proclaimed grand prince of Kiev. However, Izhaslav returns months later with an army and Vseslav flees back to Polotsk. Even there, though, he is unable to hold onto power. The Mstislav who had been forced to flee Novgorod in 1067 is given Polotsk to rule as a Rus vassal. Son of Grand Prince Izhaslav of Kiev (Turov Rurikids). Brother, and vassal of Kiev. After years of fighting against Grand Prince Izhaslav of Kiev and his vassal rulers of Polotsk, Vseslav is able to re-secure control of his own principality. Izhaslav's expulsion by his own brother in 1073 introduces political instability in Kiev that prevents any fresh attempts to control Polotsk. 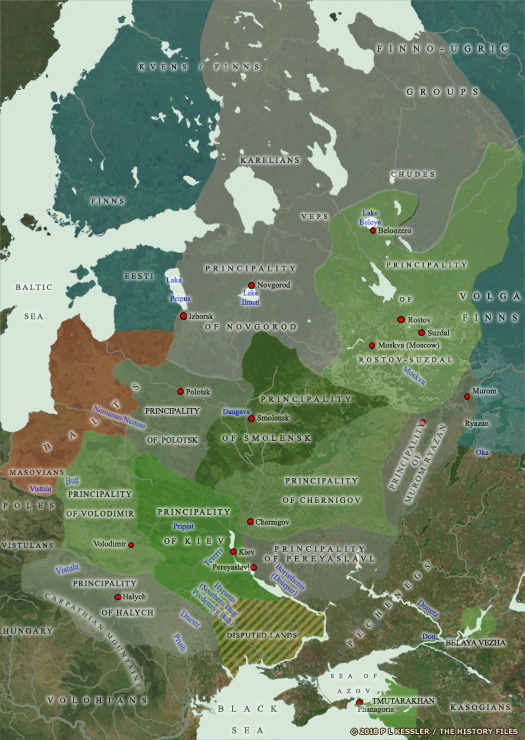 Following Vseslav's death, the greater part of his principality breaks up into smaller states which include the principalities of Druck, Jersika, Koknese (mentioned briefly in 1205 in connection with Riga), Minsk, and Vitebsk. The Lats, Livs, and neighbouring Semigallians have conflicting interests with the Rus principalities of Polotsk, Pskov, and Novgorod, with the latter two making a number of raids on north-eastern Latvia. The first major setback to Rus expansionism is the disastrous defeat of the army led by the sons of Prince Vseslav against the Semigallians (Zimegola, according to the Russian Primary Chronicle). According to the chronicle, Rus losses amount to 9,000 men. Of the Monomashichi Rurikids of Kiev. Son of Mstislav II. Mstislav the Great of Kiev is known as Harald in Norse sagas, possibly a nickname which alludes to his maternal grandfather, Harold II of England. After a lifetime spent fighting the Cumans, Estonians, Lithuanians, and Polotsk for ascendancy, his death effectively ends the unity of the Kievan Rus state. It is torn apart by various competing claims. Mstisslav's son, Iziaslav, has been governing Polotsk before briefly being replaced by Sviatopolk and then by the Vitebsk Rurikids under Vasilko Sviatoslavich. The Drutsk Rurikids are restored. It is around this time that a short-lived Lat principality which is subject to Polotsk appears in Gersik, or Gersike, situated on the right bank of the Daugava around 150 kilometres south of Riga. It only has two rulers before being conquered by the Livonian Knights. Vetseka is the ruler of the small Polotsk principality of Koknese. According to the (German) sources, Vetseka gives half of his territory to Albert of Riga in return for protection against the duchy of Samogitia and Polotsk itself. The sovereignty of Polotsk is finally revoked. Polotsk becomes a vassal of the rapidly rising power of Lithuania under its grand duke, Mindaugas. The ruler of the subject Samogitians, Tautvila, controls the principality. The first of a series of Lithuanian rulers. Polotsk is controlled by the archbishopric of Riga, before the brother of Grand Duke Gediminas of Lithuania secures the principality as a vassal state. Successive Lithuanian rulers help in fending off attacks by the Livonian Knights. Brother of Gediminas of Lithuania. Son of Algirdas of Lithuania. Jogaila of Lithuania forces Polotsk to accept his loyal brother, Skirgaila, in favour of Andrei, whom he sees as a rival. Brother of Jogaila of Lithuania. Jogaila of Lithuania is laying siege to Polotsk in support of Skirgaila when his uncle, Kestutis, removes him from the throne, triggering the Lithuanian Civil War. In 1385, Andrei surrenders his right to rule Polotsk to the Livonian Knights in order that he be protected from his enemies and rule as a vassal on a feudal estate. Restored as a vassal of the Livonian Knights. Jogaila of Lithuania attacks Polotsk and the Livonian Knights do not protect it, virtually gifting it to its attackers. The principality is abolished and becomes an administrative division of Lithuania, known as the Polotsk Voivodeship. It shares Lithuania's fate as the grand duchy is united with the kingdom of Poland, and then finally partitioned into extinction in 1795. Today the city of Polotsk forms part of the state of Belarus.